Potatoes are great for losing weight! In particular the Japanese sweet potato has it all. With dietary fiber and vitamin C you can get rid of constipation and get better looking skin. The Japanese Sweet Potato ("Satsumaimo") is packed full of goodness containing the dietary fiber and vitamin C that may be your secret for dieting to lose weight just by eating healthy. Just when you thought eating carbohydrate foods was going to make you fat, there is hope in the Satsuma-Imo diet. Are Japanese sweet potatoes good for you and going to work with your diet? The Japanese sweet potato is a low calorie food (Calories in sweet potato: 264Cal / 1 item) that not only helps satisfy your appetite but contains high nutritional value that you can expect is going to make surface in your diet sooner or later. All you have to do is replace 1 meal a day with a healthy helping of Japanese sweet potatoes to reduce calories without giving up on nutrition. Even if you are eating 3 meals a day The Japanese Sweet Potato Diet helps you cut back on calories in your diet without giving up on healthy eating and skin care benefits in your food making it reasonable for anyone to succeed in dieting. 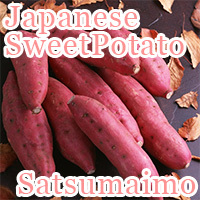 In this daily Slism, we will introduce to you how to diet on the Japanese sweet potato to reduce calorie intake getting all the nutrition, dietary fiber and vitamin C, you need to increase your chances to lose weight successfully just by eating right adding to your healthy eating weapons to get slim. What's the healthiest way to eat Satsumaimo? Like Japanese sweet potatoes there are many other great carbohydrate foods for healthy eating to choose from when planning your meals such as nutritious brown rice and even some low calorie Japanese Okayu rice porridge. 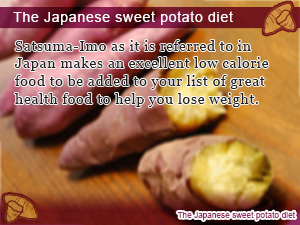 The Japanese sweet potato diet is one of those diets that are so easy that you can do it by following 1 simple rule. Eat one meal around 150 grams of baked Japanese sweet potato per day. All you have to do to make this diet work is switch your staple food to Japanese sweet potatoes for one meal a day. Although you can eat just about any side that works, you want to moderate the amount of carbohydrate foods you eat to make up for the difference made by eating Japanese Satsuma-Imo. By changing your staple food to low-calorie Japanese sweet potatoes you can greatly reduce your daily calorie intake making room for desert. Although that seems like a great way to eat the foods you want without having to get hit hard by high calories, it the diet just doesn't work that way. Avoid eating too much of other foods while on this diet. In particular, there are no real stick eating restrictions and calorie blocks that you have to worry about while on the Japanese sweet potato diet, just make sure to get enough nutrition in your diet and never going beyond 80 percent of what you can actually eat, i.e. not stuffing yourself. When eating Japanese sweet potatoes are any other potato for that matter, what people often do is discard the skin. Doing this wastes precious nutrition that could be put in your body. In fact, the skin and the parts nearest to the skin are the most nutritious parts. Not throwing away the skin and eating it helps you get more nutrition. Although there is no right or wrong way to prepare Japanese sweet potatoes for eating, steaming is a cooking method recommended. By eating a steamed potato the skin is not only edible but doesn't come with extra calories that would have to be added in using cooking techniques like frying. Note that steaming your food should not be limited cooking Japanese sweet potatoes. Feel free to steam you foods to get more out of the foods you eat saving important parts that always seem to get burnt to waist using other cooking methods. Most people can attest that they've heard eating carbohydrate foods can make you fat? Although Japanese sweet potatoes are a food with carbs, they also play an important role preventing obesity and helping to improve your bowel movement. That is why these potatoes are considering being carbohydrate food that is harder to get fat eating than most. Japanese sweet potatoes consist of over 60 percent water content not to mention very low calories with only 190 calories per 150 gram serving size. This compared to a bowl of rice ( roughly 150 grams ) which has 250 calories, can help you save as much as 60 calories per meal. In addition, the fact that Japanese sweet potatoes are grown all throughout the year means that they can be bought at an affordable price making your diet demand less from your pocket while coming with many health and beauty benefits with less stress than other diets, recommended for people looking to slim down. Japanese sweet potatoes are a great source of dietary fiber and Jalapin that are said to remedy constipation issues. Jalapin combined with dietary fiber has to be to most effective way to naturally tree constipation that work fast to restore your bowel movements back to working order. 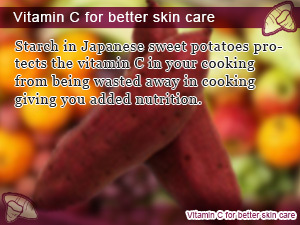 Get you daily allowance of Vitamin C eating healthy Japanese sweet potatoes. Although vitamin C is weak against heat exposure, you can rest easy because the vitamin C in these sweet potatoes is protected by starch. This allows the nutritional value of sweet potatoes to be preserved even after cooking. Due to the fact that Japanese sweet potatoes contain a substantial amount of dietary fiber you don't have to worry about an empty stomach causing your stress from fighting the urge to eat. After consumption the rich fiber in this food expands in your stomach keeping you from getting hungry longer. There are many people who have suffered from the setbacks of the Satsumaimo Diet, just because it is hard to keep on eating the same thing. At times when you feel your diet is going in the right direction but are getting bored, just change the way you prepare your food exploring new cooking ideas. However that doesn't mean you should eat only sugar-rich Gaigakuimo and sweet potatoes just yet. Due to the fact that this is an easy way to go over on calories, it isn't recommended. Take up steaming or simply throw in a salad including recipes just right for your diet for best results. Satsuma-Imo as it is referred to in Japan makes an excellent low calorie food to be added to your list of great health food to help you lose weight. 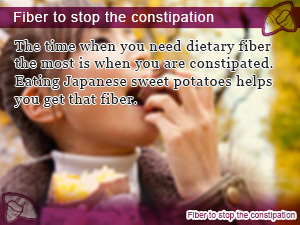 The time when you need dietary fiber the most is when you are constipated. Eating Japanese sweet potatoes helps you get that fiber. Starch in Japanese sweet potatoes protects the vitamin C in your cooking from being wasted away in cooking giving you added nutrition.